During the afternoon of Monday 18 July 1955 it got very very dark. By 4.00pm it was as dark as night and heavy rain was falling, continuing until about 7.30pm. Army lorries went up through Church Street shouting out 'don't worry if it gets any worse we're ready on Dorchester Rd to evacuate you. Children thought it was quite exciting. Roy Shepstone had an interest in the weather and measured rainfall at his home in Elwell Street. On the fateful day, a quarter of an inch fell before 10 am, the rain then eased, but by the end of the day 8.39" were recorded in his garden. At 104 Church Street, Mr Dominey found he couldn't stand in road because of force of water, he said 'something's wrong up top - that gate's come down from the farm', later on a car came juddering through, sweets from wishing well and even flagstones from paths. The family went upstairs to be safer, the water didn't come in, but all of a sudden there was a sound like an explosion and the wall opposite came down. The water went through to the river and flooded out the gatehouse of Upwey House. The lights went out because the falling wall had snapped the electricity cable. Sweets, crisp tins and groceries floated out of Mr Eckersall's shop and on down the road. Further along at 32 and 34 Church Street the houses had flagstone floors. Ron Critchell got a chisel and knocked down between the stones and the waters went down. Bunty Gee did the same - but the water came up! The family put the settee on the table and took as much as they could upstairs. The flood waters came from the field down through the scullery. A couple of pigs floated down the road (some pigs at North Manor Farm were drowned), a greenhouse, John Hare's car was taken from corner (near Masons Arms) to Island Gardens gate by the force of the water. Two men in a van got stuck in the floodwaters. 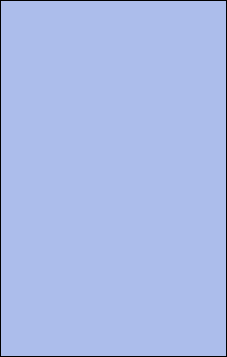 Les Hilton and Jack Gee threw them a rope; the force of the water took the smaller man off his feet and he would have been swept away if he hadn't held on to the rope. In Stottingway Street, the waters poured off the gardens at the back of numbers 11 to 17, and rushed through the cottages from back to front. Fred Virgin shouted to his wife, Beryl, to wedge the back and front doors open to let the water go through. The Cave's who lived next door, had gone to the pictures, so Fred went in and opened their doors, taking some of their possessions upstairs. In those days this was possible because people didn't lock their doors when they went out. At North Manor Farm in Watery Lane, the flood water dammed up against the garden wall between Broadwey House and the farm house; then the wall gave way and the water pushed the farm machinery and Bill Ward's car against the wall of the farmhouse. The water entered the house with terrific force, flooding the house to dining room table height. 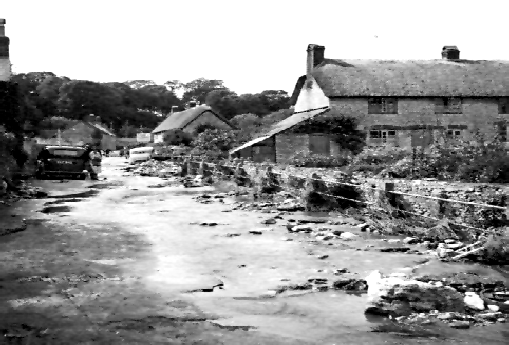 Cottages opposite Upwey Church - Mr Wells (standing) being helped by a man from Southill who had come to the village to help with the clear-up operation. 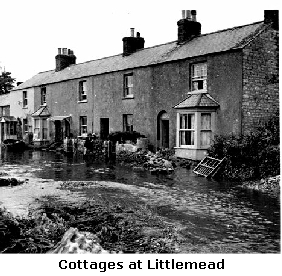 At Littlemead the water reached half way up the walls, the James family took as many of their possessions as they could upstairs and watched helplessly as three wooden huts full of young chickens from Gill's hatchery at the bottom of Mill Street were swept across the field by the force of the water and smashed into the trees. Caravans from the nearby riverside site were also carried into the waters and destroyed. 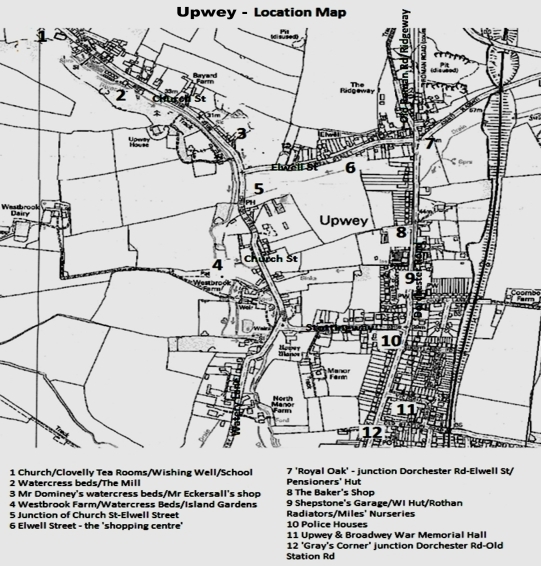 The flood left a trail of devasta tion from Upwey right down the river to Weymouth, through Broadwey, Nottington and Radipole. The clear up operation was huge with all available council workers and the armed forces pitching in to help the locals remove the debris. Families saved what they could, dried out their homes and tried to get back to normal as quickly as possible. The Mayor of Weymouth, Alderman Lawson Jones, opened an Appeal Fund on 20 July 1955 to assist those who had suffered loss and distress in the floods. By the beginning of November the fund stood at £2812. All applications for assistance and, in some cases where no applications were made but which obviously merited help, were personally investigated on the spot by well known townsmen who volunteered to help in any way they could. Aug 1955 - Brown-uniformed borstal boys have restored the 'lover's lane' walk leading into the Friar Waddon -Corton Rd at the back of the Upwey rectory, following extensive flooding and storm damage. The Rector Rev Bryant said 'there were 15 of them at work in the glebe field, under two instructors Mr WJ Keast and Mr R Toms. Nov 1955 For her courage in rescuing animals Miss O Honebon of Nottington Farm has been awarded a certificate by the RSCPA. The certificate reads 'Miss O Honebon, for her courage and humanity in rescuing 17 cows, two calves and several hens from flood water, Nottington Farm, 18 July 1955. Miss Honebon swam into the milking shed on the farm where she lives during the floods last July to release tethered cows and calves and save them from the swirling flood waters. If the owners of a wall at Church Street, Upwey do not take steps to obviate danger to the public then Weymouth Town Council have authorised the Town Clerk to apply to magistrates for an order. The Street and Works Committee reported that the wall adjoined a public footpath which had been damaged in the floods of July 1955. The footpath was now at a lower level with the result that the wall was likely to fall onto the footpath. The path had therefore been closed to the public. Remembers Farmer Childs rescuing her gran and granddad from an upstairs window, of Wishing Well Cottage during the flood. I went to London to work in 1953, at the age of sweet 16, a real shock to the system for this country girl. 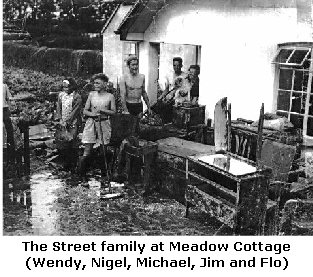 Home on holiday in July 1955 it started to rain (real stair rods!) the manure from the heap in the yard beyond the house was being washed down the road, so my dad asked me to clear the drains down Church St. I wore plimsolls, a bathing costume and a plastic mac, no good wearing anything different as too much rain. Job done and (I don't know why as it seems really silly now) my mum asked me to take an umbrella to my sister who worked at Plummer Rodis in Weymouth. Still wearing the same clothes the bus got as far as Gray's Croner and the driver refused to go any further as his brakes were dodgy. I phoned home (Upwey 260) told mum what was happening, she said you can't get up Church St there's 4 feet of water and cars etc floating down the road and for me to come via the bottom of the hill, then the phone went dead. I walked to the police house and told the village bobby what mum had said. Phone not working so he couldn't contact anyone so I said I'd walk to the top of Elwell St and get someone to stop the traffic and he would man Stottingway. I went to the Ship Inn and told them and someone blocked the top of Elwell St. I made a very wet and muddy way home. My sister and the two Wills girls also made it via the hill later in the day. 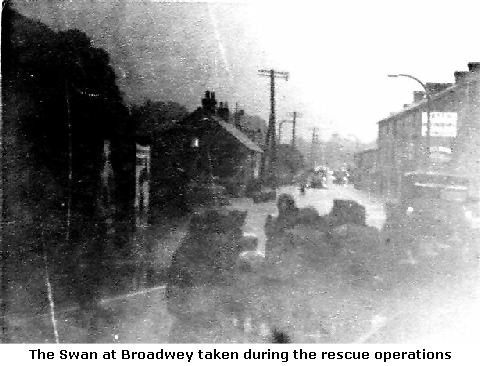 The morning after the flood I drove to Weymouth to work and on the pavement by the Swan Inn and back up the Dorchester Road by the Temperance Hall were rowing boats which had been used to rescue people from the low lying cottages along the river. 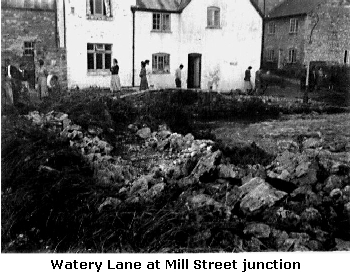 Mr Jack Comben (farmer at Westbrook Farm) told me that a wall of water came down the valley from Martinstown just like the mists came rolling down and that the water off Windsbatch crashed through the back door of the Dairy House and farm House and out the front doors. All the water was trapped behind the railway embankment of the Abbotsbury Line and the only way through was under the bridge. The force of this water gouged out a very large and deep hole in the road. 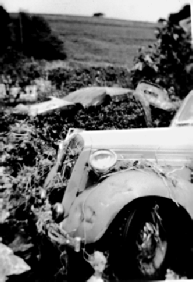 All along Church Street was debris, stones, rubbish and wrecked cars. Up by the church the lamp post in the roadway by the churchyard had lumps of chalk and coke jammed behind it nearly to the height of the wall. The coke being washed down from the pumping station at Friar Waddon. The hero of the flood was undoubtedly John Jewers (now deceased). He lived at 656 Dorchester Road. He tried desperately, but in vain to save Robin Crump who was drowned. 'Somewhere between 7 and 7.30pm on a summer evening we were watching a sports programme on TV when we heard someone shouting, I looked out of the kitchen window and saw it was Mr Fox from No.1 telling us the river was coming up. Almost immediately the carpet started to go up and down, with the water rising fast we grabbed the TV and anything else we could and took it upstairs. While I tried to save what I could, I had to give up when the kitchen window came in with the force of the water I couldn't keep the room doors open because of the water so I had to go back upstairs. 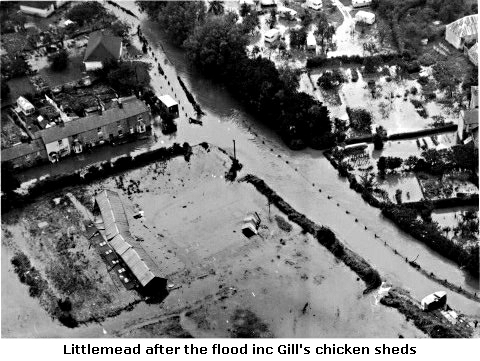 All we could do was look out of the window and watch the water rise, opposite were 3 wooden huts full of young chickens from the hatchery at the bottom of Mill St. We watched as there huts were swept across the field by the force of the water and smashed into the trees on the other side of the field. There was nothing we could do then until the next morning.